Grozet is a gooseberry flavoured beer from William Bros. Brewing Company, a Scottish brewer based in Alloa who specialise in the historic or slightly esoteric end of the market. 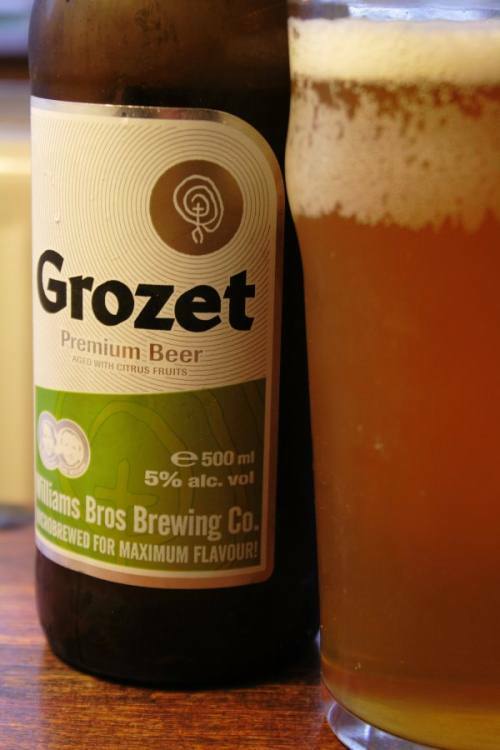 William Bros. brew a range of unusual beers, Grozet being the prime example. It’s a heritage beer, based on a 16th century beer brewed at harvest time for the labourers, who wanted something refreshing after working the fields. A beer cut through with the sharp citrus taste of the Scottish ‘hairy grape’ – cheap and plentiful in the summer – fitted the bill perfectly. This is a modern interpretation, closer to a continental beer than a 16th century Scottish ale. Grozet is light and has a clear citrus kick, a little like a Belgian fruit beer. The gooseberries make the beer distinctive and tangy, with a fresh taste and the flavour of wheat.